If the Intermediate Sherry is Amrut's sherry sandwich, then Portonova is their port sandwich. First the whisky is aged in ex-bourbon casks (and maybe some new oak casks). Next, after an unspecified length of time, that's dumped into first-fill port pipes. And then, after an unspecified length of time, that whisky gets dumped back into ex-bourbon casks. (How about that for cut-and-paste!) Not much dilution on this one as it's bottled at a booming 62.1%. This is from Portonova's very first batch. There have been at least four batches so far. 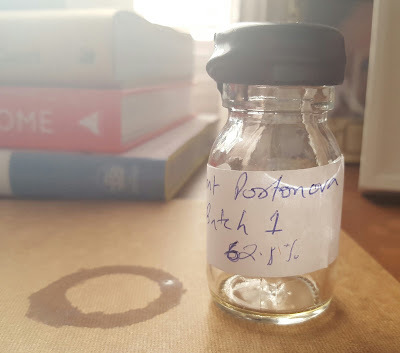 My Annoying Opinions and I did a pair of sample swaps last year, the contents of which inspired this Amrut series (continuing next week!). Nose -- Granola with dried blueberries and Big Red gum at the start. Very grapey and floral, though that's matched by some soil and (maybe?) a hint of peat. Strawberry maple syrup and dark cherries. Sometimes it feels like Amrut Fusion + new oak. Palate -- Plenty hot, but less so than the lower ABV Immediate Sherry from yesterday. It's like a cask strength port. Lots of sweet grapes, berries, and apples. Ah, those chocolate jelly rings that we used to eat during Passover ('cuz they're pareve). Tart fruit (apples and blackberries) notes develop midground after some time. A nice herbal, earthy bitterness settles in at the back of the tongue. Finish -- Dark bitter chocolate. Earthy and chili pepper spicy. Some tingly lime notes. Sugary grapes and raspberry candy (those jelly rings, again? ), though it's less sweet than the palate. Nose -- SO MUCH CHOCOLATE: fudge, cocoa, milk chocolate bars; yet it's still very floral (blooms, not perfumes). Raspberry candy. Palate -- Much mellower, less sweet, maybe even a tad malty. More spices from the oak(s). The berries and grapes remain, but now it's their essence rather than their sugars. That good earthy bitter note remain as well. Finish -- Malt, oak tannins, and dry red wine merge into a whole. It's very earthy, almost peaty again. Lingering notes of cinnamon and chili powder. Okay, maybe I'll write a little more. Something about this whisky reminds me of the also excellent Ballechin Port Cask Matured single malt. Actually, if you take that Ballechin and bump it up to cask strength then it would probably be pretty close this one. This is enormous, rich, and delicious. And I swear it's a little peaty too. Highly recommended to those folks who like a little port in their whisky. This specific batch drew a very positive review from MAO and won a bunch of awards from the Malt Maniacs in 2011. What I cannot tell you is that the rest of the batches are this good, because I haven't had them, and there will always be batch variation. That's what keeps me from running out and getting the newest edition. Also, it's expensive. But if you can find batch 1 you're in for a big treat. Availability - This specific batch has probably sold out. The newest batches are available at many specialty retailers in the US and Europe. I tried (and subsequently bought) Batch 4 (2013) last year. I thought it fantastic too. In fact it remains my favourite Amrut so far, having only tried the core range and just a couple of single cask bottlings. Great to hear the later batches are excellent too! Your Amrut experience is far broader than most whisky fans. But the Portonova is my favorite of their regular range as well. I recently managed to try a sample from the 6th batch, bottled in April of 2015, and it was as good as you've described it here, a spicy port-bomb unlike any whisky I've ever had before. Coooool. That's good news. They seem to have created something special, so I'm glad they've been able to maintain the quality throughout the batches. Inspires me to seek out a bottle, especially if it's under $100.